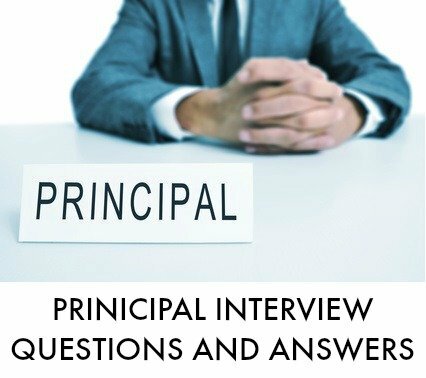 Typical principal interview questions will explore your leadership qualities, your capacity to build effective relationships, your operational management skills and your job knowledge. Use the interview answer help to prepare your own excellent answers to these interview questions. 1. Why do you want to be principal of this school? Your research and preparation is critical to answering this. Effective research will help make your answers both current and relevant. 2. What has been your greatest contribution to the schools you have worked in? to strengthening the school culture? 3. What would be your top priorities in this position? 4. How do you motivate and encourage staff? Highlight the steps you take to create a climate in which people want to perform to the best of their ability. How do you assess an individual's strengths and develop them? Highlight the mechanisms you put in place to support staff through collaboration and inclusion. 5. Outline the role that parents should play in the school? Discuss your vision of positive parental contribution and how you have facilitated and promoted this through the implementation of school initiatives. 6. How do you set about building good relationships with staff and parents? 7. What professional development activities have you undertaken recently? Research has shown that effective principals derive much of their professional development from community partnerships and colleagues. Demonstrate how your professional development activities have addressed the personal areas you identified as needing improvement or strengthening. How have these activities allowed you to perform your job more effectively? 8. What professional goals have you set yourself for the next 5 years? 9. What are the most critical inputs you can bring to this school? 10. On what criteria do you judge your success as a principal? 11. What are your major strengths as a principal? Focus on these 6 core competencies when formulating your interview answers to these principal interview questions. Leadership involves the provision of a clear purpose and direction to the school staff and students. How have you anticipated and made use of opportunities, communicated a compelling vision or purpose and developed a shared understanding of the school's objectives and activities? Focus on recognized leadership traits when providing evidence of this competency. This includes the ability to implement processes, procedures and policies for managing and maximizing relevant data to facilitate decision-making and goal setting. Use your knowledge of what makes a good manager to develop your answers. Principals should be a source of information on current educational trends and effective learning and instructional trends. Discuss how you have fostered a climate of inclusion and integration. Are you able to present information in an accessible and clear manner and to adapt your communication style to your audience - students, staff, parents and community? Discuss how you facilitate teamwork and resolve conflict. This involves the use of logic, inputs and experience to make appropriate decisions. How have you established shared ownership of the decision within the learning environment and community? Decision making is one of the 12 core competencies identified as essential to success across a wide range of career fields. What are your strengths and weaknesses as a principal? Use this comprehensive list of strengths to provide an insightful answer. This complete guide to the teacher interview provides excellent guidelines on answering educational questions. Be fully confident about answering behavioral interview questions. You can expect a number of these type of competency based interview questions. A principal is a manager in an educational milieu. View management job interview questions as a further resource in preparing for principal interview questions. Be ready with a set of insightful principal interview questions to ask the interviewers.